Hungary is one of the best destinations worldwide to welcome a new year. 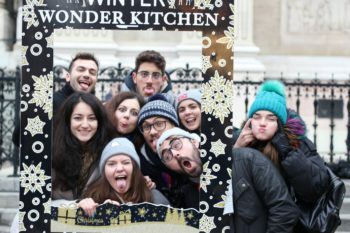 The organisers from AEGEE-Budapest and AEGEE-Pécs jammed every possible attraction into the programme of their event “Winter Wonderland – Magic will find you in BudaPécs”: from winetasting to ice-skating and visiting the famous Széchenyi open air spa. 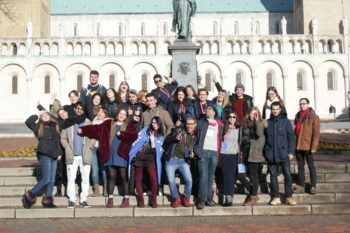 No surprise that the 32 participants of the event, which took place from 27th of December 2017 to 2nd of January 2018, had an amazing time. The group in front of the Hungarian parliament in Budapest. Marcell Buzás: Out of almost a 100 applicants initially, we had to select the very best 25. Then it turned out we had some extra space in our Budapest accommodation so we could accept 10 more participants. In the end we started the event with 25 people in Pécs and 7 more joined us for the Budapest part, so it was 32 altogether. 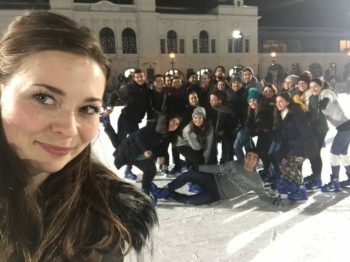 At the famous Városliget Ice-skating rink. Marcell: Our theme as it was written in the title was “Winter Wonderland”. We jammed the programme with our favorite winter time activities and traditions. We got lost in Christmas markets. We visited the most famous and beautiful open-air spa in Budapest. 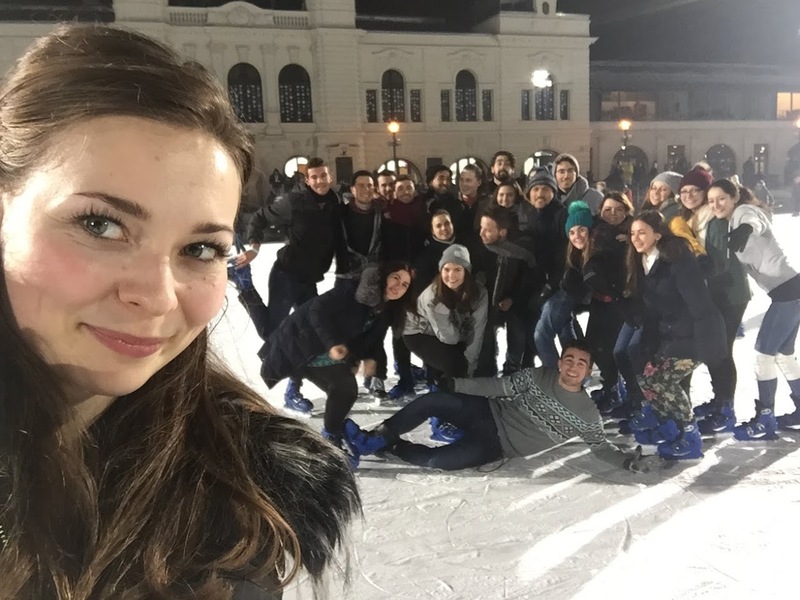 We skated on the biggest ice-rink in Budapest. We spiced everything up with our best hot wine recipe and we did all that in holiday spirit with our additional cozy and loving team spirit. The best participants you could wish for met in Hungary! Marcell: The afternoon started in one of the most famous thermal baths in Budapest to get our systems ready! For the night we have rented a club in Budapest where we had a party together with 125 AEGEEans. 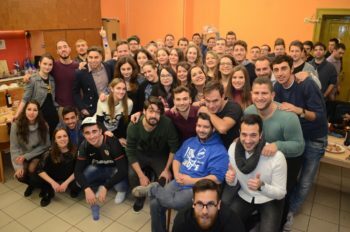 Everyone was there from our event, AEGEEans from other locals currently in town and of course our Hungarian AEGEE-BudaPécs and AEGEE-Debrecen members. It was a proper AEGEEan way to end the old and start the new. We partied until around 6 AM! Winetasting at Gergen Winery close to Pécs. The European Night also treated our senses with pleasures and challenges. The event turned out to be bigger than planned. We had a numerous delegation from AEGEE-Catania, including our awesome Agora Catania organizers for example, and some other locals as well, all of them brought something special from their country so we had more than enough things to try. After the European Night we made our own party again at the exact same location with our very own sound engineers and DJs. Last but not least the time spent at the Széchenyi Bath in Budapest was a highlight for everyone. We went there before our New Year’s party and we spent around four hours at the spa. Staying in hot pools while it is around zero degrees outside is already quite special. Add some champagne that you can also drink in the pool and some cool AEGEEans and you have the recipe of a good time. 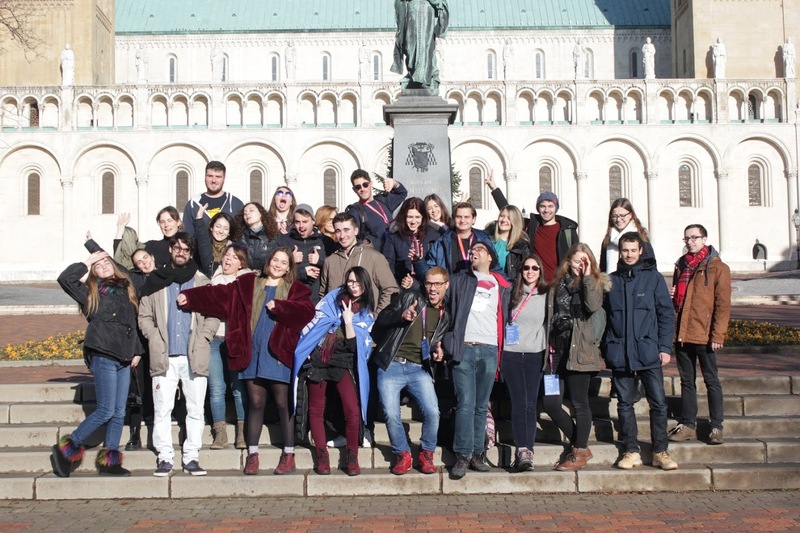 Group picture in front of the Cathedral of Pécs. Doing five minutes long applauses and standing ovations for every possible occasion because we just celebrated every moment. Those times when it is either the “breakfast is ready” or “the bus is leaving”. The bus ride home from the winetasting was where the effects of the wine tasting really kicked in. We have proven again that AEGEEans can make a party even on a public bus and German guys are successful in picking up local girls even with a five liter wine bottle in the hands. Singing way too many Hungarian songs with organizers and playing “Sarà perché ti amo” on a loop because “Sarà perché ti amo”. The crazy tasks during the pub crawl when a part of your team is singing your team’s song “The Marvelous Breadfish” while one Italian male participant collects around 20 condoms from random people. The midnight at New Year’s Eve where you actually felt the love in the group. and a lot more that I forgot to add now and I will regret it later when I remember. At the Budapest Christmas Market. Marcell: We started the event with awesome people. We could tell it already tell from the motivation letters. In other words: people were as advertised! The ice-breaking sessions worked effectively. We had plenty of time to socialize in Pécs and the group cohesion started to strengthen from the very first night. 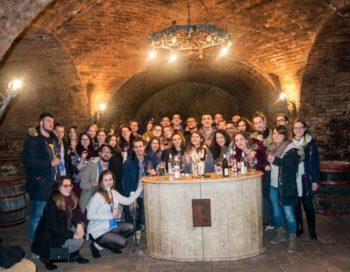 The second day with the wine tasting just deepened the ties between participants and organizers alike. We built a quite warm and loving atmosphere. Of course most of all we had a lot of fun together. People were quite energetic despite the long nights of partying basically every night. As organizers we can say it was a pleasure to spend time with and organize an event for such an amazing team of participants. Marcell: We miss you all! You deserve the same applause and amount of hugs that we had received from you so many times! You will have quite a lot of chances to visit Hungary this year again. 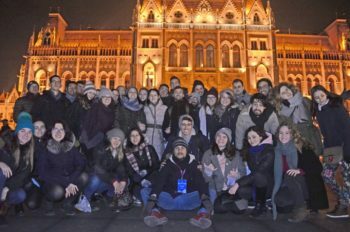 The Summer University Project School is taking place in Budapest from the 1st until the 4th of February and there is an open call for the event, so do not hesitate to apply! 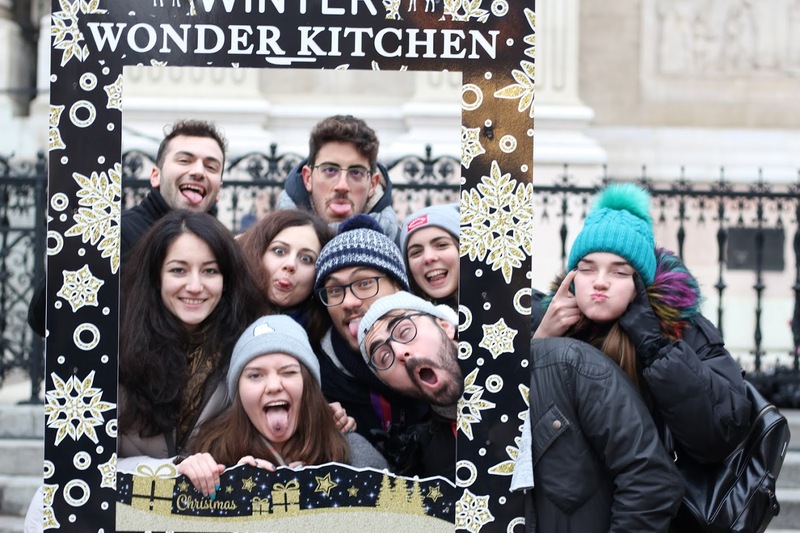 A bit of Budapest is always good plus you can learn some useful event organization skills – not only for an SU – from an experienced pool of trainers in this amazing city. Agora Kraków is coming and AEGEE-Budapest is preparing with a pre-event too! The planned dates are from the 20th until the 23rd of April. Further details are coming soon but we can tell in advance that you can experience some of the famous programme highlights from our previous events plus you might be able to meet some AEGEE-Pécs organizers and helpers in town as well.